My research seeks to understand the mechanisms by which the cutting-edge of the capitalist political economic system evolves. A particular interest is the way entrepreneurs develop and commercialize new technologies that build new industries and reorganize existing ones. While some of these technologies have only localized impacts, the most powerful of these can lead to the emergence of new institutions, ways of organizing work, and spatial dimensions of capitalism as a system. I have explored all of these dimensions in my research. First, the role of the research university as a source of potentially commercializeable knowledge and the paths by which that knowledge becomes commercialized. Second, the geography of innovation and entrepreneurship and, in particular, the cutting-edge technological information and communication technology-based clusters such as Silicon Valley. Third, the history of how capital is allocated finance innovation and, in particular, the role and development of venture capital and stock markets in the current US national innovation system. Finally, more recently, I have become interested in the impact of China on the configuration of global capitalism. While much of research is at the micro-level and phenomenon-based, it is informed by the implications of these topics for the evolution of the capitalism as social and economic system. Biagioli, M., Kenney, M., Martin, B.R., and Walsh, J.P. 2019. Academic Misconduct, Misrepresentation and Gaming: A Reassessment. Forthcoming in Research Policy. Liu, Q., D. Patton, M. Kenney. 2018. Do University Mergers Create Academic Synergy? Evidence from China and the Nordic Countries. Research Policy 47 (1): 98-107. Kenney, M. and D. Patton. 2017. Sub-National Technology Policy and Commerce: Evaluating the Impacts of the California Institute for Regenerative Medicine. Journal of Technology Transfer. 1-22. Chen, A., D. Patton, and M. Kenney. 2016. University technology transfer in China: a literature review and taxonomy. Journal of Technology Transfer 41(5): 891-929. Huang , X., Patton, D., and Kenney, M. 2015. Responding to uncertainty: Syndication partner choice by foreign venture capital firms in China. Venture Capital, 17 (3): 215-235. Kenney, M. and D. Patton. 2015. One Size Does Not Fit Them All: Comparing the Biological Sciences and Information Technology. In S. Breznitz and H. Etzkowitz (Eds.) University-Industry Technology Transfer. Print. Kenney, M. 2015. Commercialization or Engagement: Which Is of More Significance for Regional Economies? In Audretsch, D., Link, A, and Walshok, M. (Eds). Oxford Handbook of Local Competitiveness (Oxford: Oxford University Press). Kenney, M., D. Mowery, and D. Patton. 2014. Electrical Engineering and Computer Science at UC Berkeley and Silicon Valley: Modes of Regional Engagement. In M. Kenney and D. Mowery. (Eds.) 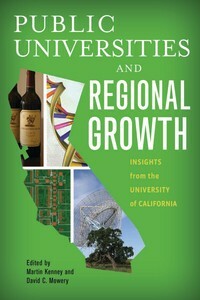 Public Universities and Regional Development: Insights from the University of California. (Stanford: Stanford University Press). M. Kenney and D. Mowery. (Eds.) 2014. Public Universities and Regional Development: Insights from the University of California. (Stanford: Stanford University Press). Zhang, H., D. Patton, and M. Kenney. 2013. Building Global-Class Universities: Assessing the Impact of the 985 Project. Research Policy 42, (3): 765-775. Kenney, M. and D. Patton. 2012. Bayh-Dole and Alternative University Technology Transfer Regimes. In D.G. Assimakopoulos et al. (eds.) Knowledge Perspectives of New Product Development Springer Science+Business Media pp. 253-268. Kenney, M. and D. Patton. 2011. Does Inventor Ownership Encourage University Research-Derived Entrepreneurship? A Six University Comparison. Research Policy 40, (8): 1100-1112. Grimaldi, R., M. Kenney, D.S. Siegel, and M. Wright. 2011. 30 Years after Bayh-Dole: Reassessing Academic Entrepreneurship. Research Policy 40, (8): 1045-1144. Patton, D. and M. Kenney. 2010. The role of the university in the genesis and evolution of research-based clusters. In D. Fornahl, S. Henn, and M-P Menzel (Eds.) Emerging Clusters (Cheltenham, UK: Edward Elgar) pp. 214-238. Kenney, M., A. Nelson, and D. Patton. 2009. The University-centric High-tech Cluster of Madison, United States. In J. Potter and G. Miranda (Eds.) Clusters, Innovation and Entrepreneurship (Paris: OECD) pp. 167-192. Kenney, M. and D. Patton. 2009. Reconsidering the Bayh-Dole Act and the Current University Invention Ownership Model. Research Policy 38, (9):1407-1422. D-W. Sohn and M. Kenney. 2007. Universities, Clusters, and Innovation Systems: The Case of Seoul, Korea. World Development (35) 6: 991-1004. K. Chen and M. Kenney. 2007. Universities/Research Institutes and Regional Innovation Systems: The Cases of Beijing and Shenzhen. World Development (35) 6: 1056-1074. M. Kenney and W. R. Goe. 2004. The Role of Social Embeddedness in Professorial Entrepreneurship: A Comparison of Electrical Engineering and Computer Science at UC Berkeley and Stanford. Research Policy 33 (5): 691-707. M. Kenney. 1998. Biotechnology and the Creation of a New Economic Space. In A. Thackray (ed.) Private Science: Biotechnology and the Rise of Molecular Sciences (Philadelphia: University of Pennsylvania Press): 131-143. M. Kenney. 1986. Biotechnology and the Creation of a New Economic Space. (New Haven: Yale University Press). Print. Kai, J., Kenney, M. and Zysman, J. 2019. Global Competitors? Mapping the Internationalization Strategies of Chinese Digital Platform Firms. In International Business in the Information and Digital Age (Emerald Publishing Limited): 187-215. Kenney, M. and Zysman, J. 2019. Work and Value Creation in the Platform Economy. In Work and Labor in the Digital Age (Emerald Publishing Limited): 13-41. Kenney, M., Rouvinen, P. and Zysman, J. 2019. Employment, Work, and Value Creation in the Era of Digital Platforms. Forthcoming. Zysman, J., Kenney, M. and Tyson, L. 2019. Beyond Hype and Despair: Developing Healthy Communities in the Era of Intelligent Tools. Innovation Policy White Paper Series 2019-01, University of Toronto. Nambisan, S., Siegel, D. and Kenney, M. 2018. On open innovation, platforms, and entrepreneurship. Strategic Entrepreneurship Journal, 12: 354-368. Silva, S., and Kenney, M. 2018. Algorithms, Platforms, and Ethnic Bias: An Integrative Essay. Phlyon: The Clark Atlanta University Review of Race and Culture. Zysman, J. and Kenney, M. 2018. The Next Phase in the Digital Revolution: Intelligent Tools, Platforms, Growth, Employment. Communications of the ACM, 61(2), 54-63. Zysman, J. and M. Kenney. 2017. Intelligent Tools and Digital Platforms: Implications for Work and Employment. Intereconomics (6): 329-334. Kenney, M. and J. Zysman. 2016. The Rise of the Platform Economy. Issues in Science and Technology 32 (3): 61-69. Feldman, M., M. Kenney, F. Lissoni. 2015. The New Data Frontier. Research Policy 44 (9): 1629-1632. Pon, B., Seppala, T., and Kenney, M. 2015. One Ring to Unite the All: Convergence, the Smartphone, and the Cloud. Journal of Industry, Competition, and Trade. 15(1): 21-33. Pon, B., Kenney, M., and Seppala, T. 2015. Firm strategy and platform control in the post-PC world: The demise of operating system-based power? Telecommunications Policy 38(11), 979-991. Breznitz, D. M. Kenney, P. Rouvinen, J. Zysman and P. Ylä-Anttila. 2011. Value Capture and Policy Design in a Digital Economy. Journal of Industry, Competition and Trade 11, (3): 203-207. 147. Kenney, M and B. Pon. 2011. Structuring the Smartphone Industry: Is the Mobile Internet OS Platform the Key? Journal of Industry, Competition and Trade 11, (3): 239-261. Kenney, M., S. Massini and T. P. Murtha. 2009. Offshoring administrative and technical work: New fields for understanding the global enterprise. Journal of International Business Studies. Benhamou, E. et al. 2009. Assessing the Impacts of Changes in the Information Technology R&D Ecosystem: Retaining Leadership in an Increasingly Global Environment (Washington, DC: National Academies Press). Dossani, R. and M. Kenney. 2009. Service Provision for the Global Economy: The evolving Indian experience. Review of Policy Research 26, (1-2): 77-104. Dossani, R. and M. Kenney. 2008. Implications of Globalization for Software Engineering. In National Academy of Engineering (Ed.) The Offshoring of Engineering: Facts, Unknowns, and Potential Implications (Washington, DC: National Academies Press): 49-68. R. Dossani and M. Kenney. 2007. The Next Wave of Globalization: Relocating Service Provision to India. World Development 35, (5): 772-791. M. Kenney and R. Dossani. 2006. Digitizing Services: What Stays Where and Why. In S. Bagchi-Sen and H.L. Smith (eds.) Economic Geography: Past, Present and Future (Oxon, UK: Routledge): 136-144. R. Dossani and M. Kenney. 2006. The Relocation of Service Providers to Developing Nations: The Case of India. In J. Zysman and A. Newman (Eds.) How Revolutionary Was the Digital Revolution (Stanford: Stanford University Press): 193-216. R. Dossani and M. Kenney. 2004. Moving Tata Consultancy Services into the ‘Global Top 10’. Journal of Strategic Management Education 1 (2): 383-402. D. Mayer and M. Kenney. 2004. Ecosystems and Acquisition Management: Understanding Cisco’s Strategy. Industry and Innovation 11, (4): 299-326. M Kenney. 2004. What Goes Up, Must Come Down: The Politics of the U.S. Internet Industry. In Jens Frøslev Christensen (Ed.) Industrial Dynamics of the New Digital Economy (Cheltenham: UK and Northampton, USA: Edward Elgar): 33-55. R. Dossani and M. Kenney. 2003. ‘Lift and Shift’: Moving the Back Office to India. Information Technology and International Development 1 (2): 21-37. U. v. Burg and M. Kenney. 2003. Sponsors, Communities, and Standards: Ethernet vs. Token Ring in the Local Area Networking Business. Industry and Innovation 10 (4): 351-375. J. Curry, and M. Kenney 2003. The Organizational and Geographic Configuration of the Personal Computer Value Chain. In M. Kenney with R. Florida (eds.) Locating Global Advantage (Stanford: Stanford University Press) pp. 113-141. M. Kenney. 2003. The Growth and Development of the Internet in the United States. B. Kogut (Ed.) The Global Internet Economy (Cambridge: MIT Press): 69-108. M. Kenney and J. Curry. 2002. The Internet and the Personal Computer Value Chain. In BRIE-IGCC E-conomy Project (eds.). Tracking a Transformation. (Washington, DC: Brookings Institution Press): 151-177. M. Kenney and J. Curry. 2001. Beyond Transaction Costs: E-commerce and the Power of the Internet Dataspace. In T. Leinbach and S. Brunn (eds.) Worlds of E-Commerce: Economic, Geographical and Social Dimensions (New York: Wiley): 45-65. M. Kenney. 2001. The Temporal Dynamics of Knowledge Creation in the Information Society. In Ikujiro Nonaka and Toshihiro Nishiguchi (ed.) Knowledge Emergence: Social, Technical, and Evolutionary Dimensions of Knowledge Creation (New York: Oxford University Press): 93-110. M. Kenney and J. Curry. 1999. Knowledge Creation and Temporality in the Information Economy. In Raghu Garud and Joe Porac (eds.) Cognition, Knowledge, and Organizations (Connecticut: JAI Press): 149-170. M. Kenney and J. Curry. 1999. E-Commerce: Implications for Firm Strategy and Industry Configuration. Industry and Innovation 6 (2): 131-151. J. Curry and M. Kenney. 1999. Beating the Clock: Corporate Responses to Rapid Change in the PC Industry. California Management Review (Fall): 8-36. M. Kenney and J. Curry. 1998. The Internet, New Firm Formation, and Enterprise Patterns Hitotsubashi Business Review, 46 (2): 19-35. M. Kenney. 1997. Value Creation in the Late 20th Century: The Rise of the Knowledge Worker. In J. Davis, T. Hirshl, and M. Stack (eds.) Cutting Edge: Technology, Information, Capitalism and Social Revolution (London: Verso): 87-102. M. Kenney (Ed.). Hardback and paperback 2000. Understanding Silicon Valley: Anatomy of an Entrepreneurial Region (Stanford: Stanford University Press). Kenney, M. and D. Patton. 2015. Gender, Ethnicity and Entrepreneurship in Initial Public Offerings: Illustrations from an Open Database. Research Policy, 44 (9): 1773-1784. Autio, E. M. Kenney, P. Mustar, D. Siegel, and M. Wright. 2014. Entrepreneurial Innovation: The Importance of Context. Research Policy 43, (7): 1097-1108. Kenney, M., D. Breznitz, M. Murphree. 2013 Coming back home after the sun rises: Returnee entrepreneurs and growth of high tech industries. Research Policy. 42, (2): 391-407. Kenney, M. 2008. Lessons from the Development of Silicon Valley and Its Entrepreneurial Support Networks. In S. Yusuf, K. Nabeshima, and S. Yamashita (Eds.) Growing Industrial Clusters in Asia: Serendipity and Science (Washington, DC: The World Bank): 39-66. M. Kenney and D. Patton. 2006. The Coevolution of Technologies and Institutions: Silicon Valley as the Iconic High-Technology Cluster. In P. Braunerhjelm and M. Feldman (Eds.) 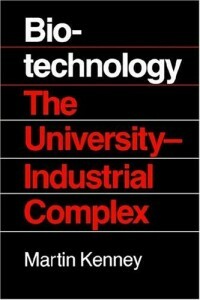 Cluster Genesis: Technology-Based Industrial Development (Oxford: Oxford University Press): 38-60. D. Patton and M. Kenney. 2005. The Spatial Configuration of the Entrepreneurial Support Network for the Semiconductor Industry. R&D Management 35 (1): 1-18. M. Kenney and D. Patton. 2005. Entrepreneurial Geographies: Support Networks in Three High-Tech Industries. Economic Geography 81 (2): 201-228. D. Patton and M. Kenney. 2005. The Spatial Distribution of Entrepreneurial Support Networks: Evidence from Semiconductor Initial Public Offerings From 1996 Through 2000. In Dirk Fornahl (Ed.) The Role of Labor Market Mobility and Informal Networks for Knowledge Transfer. (London: Kluwer). M. Kenney and U. v. Burg. 2001. Paths and Regions: The Creation and Growth of Silicon Valley. In R. Garud and P. Karnoe (Eds.) Path Dependence and Path Creation (New York: Lawrence Erlbaum and Associates): 127-148. M. Kenney and U. v. Burg. 1999. Technology and Path Dependence: The Divergence between Silicon Valley and Route 128. Industrial and Corporate Change 8 (1): 67-103. Kenney, M., and Zysman, J. 2018. Unicorns, Cheshire cats, and the new dilemmas of entrepreneurial finance. Venture Capital, 21(1): 35-50. Kenney, M. 1986, paperback 1988. Biotechnology: The University-Industrial Complex. (New Haven: Yale University Press). Klingler-Vidra, R., M. Kenney, and D. Breznitz, 2016. Policies for Financing Entrepreneurship through Venture Capital: Learning from the Successes of Israel and Taiwan. International Journal of Innovation and Regional Development. M. Kenney and A. Hargadon. 2013. Venture Capital and Clean Technology. In J. Zysman and M. Huberty (Eds.) Can Green Sustain Growth? (Stanford: Stanford University Press). Hargadon, A. and M. Kenney. 2012. Misguided Policy? Following Venture Capital into Clean Technology. California Management Review 54, (2): 118-139. Kenney, M. 2013. Venture Capital. In The Encyclopedia of the Social and Behavioral Sciences. Kenney, M. 2011. How Venture Capital Became a Component of the U.S.NSI. Industrial and Corporate Change 20, (6): 1677-1723. Kenney, M. 2011. Venture Capital Investment in the Greentech Industries: A Provocative Essay. In Handbook of Research on Energy Entrepreneurship (Eds. R Wustenhagen and R. Wuebker) London: Edward Elgar Publishing pp. 214-228. Kenney, M., M. Haemmig, and W. R. Goe. 2008. Venture Capital. In J. Macher and D. Mowery (Eds.) 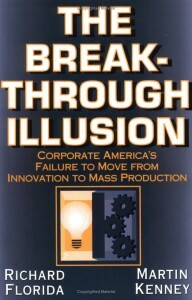 Innovation in Global Industries (Washington, DC: National Academies Press): 313-340. M. Kenney, K. Han, and S. Tanaka. 2007. Venture Capital in Asia. In H. Rowen, M. G. Hancock, and W. F. Miller (Eds.) Making IT: The Rise of Asia in High Tech (Stanford: Stanford University Press): 290-322. G. Avnimelech, M. Kenney, and M. Teubal. 2005. A Life-Cycle Model for the Creation of National Venture Capital Industries. In E. Giuliani, R. Rabellotti, and M. Dijk (Eds.) Clusters Facing Competition: The Importance of External Linkages (London: Ashgate): 195-214. D. Hsu and M. Kenney. 2005. Organizing Venture Capital: The Rise and Demise of American Research & Development Corporation, 1946-1973. Industrial and Corporate Change 14: 579-616. M. Kenney, K. Han, and S. Tanaka. 2004. Venture Capital Industries in East Asia. In S. Yusuf, M. Altaf, and K. Nabeshima (Eds.) Global Change and East Asian Policy Initiatives (Oxford: Oxford University Press): 391-427. M. Kenney, K. Han, and S. Tanaka. 2003. The Globalization of Venture Capital: The Cases of Taiwan and Japan. In Anthony Bartzokas and Sunil Mani (Eds.) Financial Systems, Corporate Investment in Innovation and Venture Capital (Cheltenham: UK and Northampton, MA: Edward Elgar): 52-84. M. Kenney. 2004. Venture Capital. International Encyclopedia of the Social and Behavioral Sciences Editors-in-Chief N. J. Smelser and P. B. Baltes pp. 16158-16161. R. Dossani and M. Kenney. 2002. Creating an Environment for Venture Capital in India. World Development, 30 (2): 227-253. U. v. Burg and M. Kenney. 2001. Capital and Technology: Venture Capital and the Establishment of the Local Area Networking Industry in Silicon Valley. In S. Yonekura and M. Lynskey (eds.). The Entrepreneur and Organization: Comparative Perspectives (New York: Oxford University Press): 209-237. M. Kenney and R. Florida. 2000. Venture Capital in Silicon Valley: Fueling New Firm Formation. In M. Kenney (Ed.). 2000. Understanding Silicon Valley: Anatomy of an Entrepreneurial Region (Stanford: Stanford University Press): 98-123. U. von Burg and M. Kenney. 2000. There at the Beginning: Venture Capital and the Creation of the Local Area Networking Industry. Research Policy 29 (9): 1135-1155. Florida, R. and M. Kenney. 1988. “Venture Capital and High Technology Entrepreneurship.” Journal of Business Venturing 3 (4):301-19. Florida, R. and M. Kenney. 1988. “Venture Capital-Financed Innovation and Technological Change in the US.” Research Policy 17 (3):119-37. A. Lewin, M. Kenney, JP Murmann (Eds.) 2016. 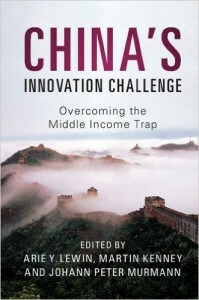 Innovation in China (Cambridge: Cambridge University Press) Translated into Chinese 2016. Beijing University Press. Seppälä, T., M. Kenney, and J. Ali-Yrkko. 2014. Global Value Chains with Transfer Pricing: A Product-Level Supply-Chain Analysis. Supply Chain Management: an International Journal. M. Kenney with R. Florida (Eds.). 2004. 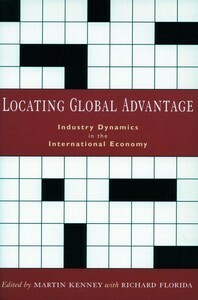 Locating Global Advantage: Industry Dynamics in the International Economy (Stanford: Stanford University Press). R. Florida and M. Kenney. 2000 hbk, 2001 pbk. Transfer and Replication of Organizational Capabilities. In G. Dosi, R. Nelson, S. Winter (eds.) The Nature and Dynamics of Organizational Capabilities (New York: Oxford University Press): 281-310. M. Kenney. 1999. Institutions and Knowledge: The Dilemmas of Success in the Korean Electronics Industry. Asian Pacific Business Review 5 (1): 1-28. M. Kenney. 1999. Transplantation? 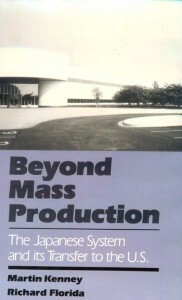 : Comparing Japanese Television Assembly Plants in Japan and the U.S. In Paul Adler, W. Mark Fruin, and Jeffrey Liker (eds.) Remade in America (New York: Oxford University Press): 256-293). N. Lowe and M. Kenney. 1999. Foreign Investment and the Global Geography of Production: Why the Mexican Consumer Electronics Industry Failed. World Development 27 (8): 1427-1443. M. Tolich, M. Kenney, and N. Biggart. 1999. Managing the Managers: Japanese Management Strategies in the U.S. Journal of Management Studies 36 (5):587-607. R. Delbridge, M. Kenney and J. Lowe. 1998. UK Manufacturing in the 21st Century: Learning Factories and Knowledge Workers? In R. Delbridge and J. Lowe (eds.) Manufacturing in Transition (London: Routledge): 224-241. N. Lowe and M. Kenney. 1998. To Create an Industry: The Growth of Consumer Electronics Manufacturing in Mexico and Taiwan. Science, Technology and Society 3 (1): 49-74. M. Kenney, J. Romero, D. Choi. 1997. Japanese and Korean Investment in the Maquiladoras: What Role in Global Value Chains? Estudios Sociales 7, (14): 99-124. D. Choi and M. Kenney. 1997. The Globalization of Korean Industry: Korean Maquiladoras in Mexico. Frontera Norte 9, (January-June): 5-22. S. Tanaka and M. Kenney. 1996. U.S. and Japanese Electronics Industries in Malaysia: A Comparative Analysis. Journal of International Cooperation Studies 4, (1): 59-72. R. Florida and M. Kenney. 1996. Social Organization, Labor Policy, and Labor Relations in Japan’s U.S. Transplants. In F. Deyo (ed.) Social Reconstructions of the World Automobile Industry : Competition, Power and Industrial Flexibility (London: Macmillan Press): 51-86. M. Kenney and R. Florida. 1995. The Transfer of Japanese Management Styles in Two U.S. Transplant Industries: Autos and Electronics. Journal of Management Studies 32, (6): 789-802. R. Florida and M. Kenney. 1994. The Internationalization of Japanese Corporate R&D. Economic Geography 70, (40): 344-369. M. Kenney and R. Florida. 1994. Japanese Maquiladoras: Production Organization and Global Commodity Chains. World Development 22, (1): 27-44. M. Kenney and R. Florida. 1994. The Organization and Geography of Japanese R&D: Results from a Survey of Japanese Electronics and Biotechnology Firms. Research Policy 23: 305-323. P. Rouvinen and M. Kenney. 2015. “Tervetuloa uusi työ” (in Finnish). Talouselämä (Finnish Business Week), (33) 35-37. Kushida, K and M. Kenney. 2014. “Positioning ‘Galapagos Japan’ in the cloud world.” Nikkei Asian Review. Kenney, M. 2014. “Silicon Valley’s Spy Problem.” Project Syndicate. Kenney, M. 2013. “Could the National Security State Destroy the Silicon Valley Business Model?” Los Angeles Daily Journal (August 6, 2013): 1, 6. Kenney, M. 2012. “California’s unrivaled capacity for innovation.” San Francisco Daily Journal 27: 1, 6. Kenney, M. 2012. “Weak justifications for the JOBS Act.” San Francisco Daily Journal 27: 1, 7. Kenney, M. and T. Seppala. 2012. “Silicon Valley is doing it again.” San Francisco Daily Journal 26: 1, 7. Kenney, M. 2012. “Equity markets: Aim higher than a quick exit.” San Francisco Daily Journal 20: 7. Kenney, M. 2012. “Entrepreneurship and venture capital in China.” San Francisco Daily Journal 19: 1, 4. Kenney, M. 2012. “Crowdfunding: making sure it works.” San Francisco Daily Journal 16: 1, 6. Kenney, M. 2012. “Venture capital: a dysfunctional system?” San Francisco Daily Journal 12: 1, 6. Kenney, M. 2012. “Venture Capital Has a Role, But Do not Forget Nice Growth Firms.” In Growth Enterprise Review (title translated from Finnish) Government of Finland, Ministry of Education, Helsinki, Finland. Kenney, M. 2011. “Silicon Valley’s Head Start.” New York Times.